So we’re all more stuffed with Christmas food than a giant turkey and we can stand the smell of it no more. Quite often it’s the said turkey or some meat’n potatoes variation. Tradition oblige. But how about fish? In France, sea creatures of most kinds – some you hardly know are edible or even exist – are filling the already overfilled supermarkets and Christmas markets, and every respectable deli or primeur adds a seafood section neatly and temptingly lined up with fresh oysters, urchins, lobsters, crabs, shrimps, barnacles, cockles & mussels and all their relatives. Not to mention caviar. There’s also seafood named after saints. Saint-Jacques, Saint-Pierre… The latter has a less saintly name in English; John Dory. Seems Mr Dory was the hero of an old English ballad. And if you want to really stand out, Barracuda is the fish for you. Or you could make a shellfish Christmas tree, apparently it only takes 15 minutes. In Norway, they do funny things with fish for Christmas. 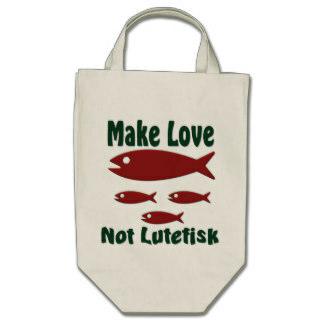 Lutefisk: Take stockfish (dried cod) and water it out for a week, then let it soak in lye for a couple of days (easy peasy to make yourself with caustic soda or ash – no joke and not dangerous!) before you water it out again for a couple of more days (by now it has become fish jello with a particular taste). Serve with mashed peas, bacon, brown sweet cheese and aquavit..anything to drown the taste). The Lutefisk Belt runs through US states of Wisconsin and Minnesota and is affectionately called so due to the large number of Norwegian immigrants to the area. 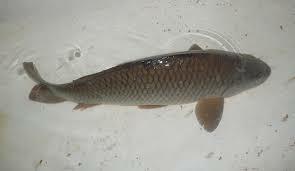 On Christmas Eve, in certain regions, normal cod is used instead. Rakfisk: Cover the bottom of a big recipient with salt, take rinsed trouts and fill them with a mixture of sugar and salt and add them in layers with salt in between. Put a lid on it with something heavy on top and put it somewhere cold (4°C). Leave it there for months. The longer, the stronger. 3-4 months and it’ll be quite mild (well…), 1 year and it’ll be anything but mild. Traditionally served sliced and topped with (a lot of) sour cream and chopped red onions and good potatoes or traditional bread. Gravlaks: These days so widely recognised as a delicacy that it’s hardly special. And it is indeed delicious. Very briefly, cover two sides of salmon fillet with a mix of sugar, salt and dill (and an optional splash of cognac! ), put the meat sides together, cover and put in fridge with something heavy on top for something like 3 days. (You may vary the herbs and use thyme for example.). Lovely on blinis with sour cream. In Sweden, they eat rotten fish as well. Fermented herring (surströmming) are small Baltic herring caught in the spring, salted and left to ferment at leisure before being stuffed in a tin about a month before it hits the tables and shops. The fermentation process continues in the tin; ‘souring’ as the Swedes refer to it, and results in a bulging tin of fermented herring or surströmming. The aroma is pungent, and the taste is rounded yet piquant with a distinct acidity (source: http://www.visitsweden.com). But in the end, perhaps nothing tops the Feast of the Seven Fishes (Festa dei sette pesci), a.k.a. the Vigil, a celebration of Christmas Eve originally from Southern Italy which is also a tradition in Italian-American communities. The seven course feast may include anchovies, whiting, lobster, sardines, eel, cod, squid, shrimps, mussels and clams, and the highlight is often Baccalà. Seven might refer to the seven sacraments, but apparently some with an even bigger appetite do 12 for the 12 apostles or even 13, adding Jesus. Christmas Eve was a fasting day, hence no meat, which accounts for the fish feasts not only in Italy but also in Norway. Note that recipes are approximate. Contact Clew should you need precisions.